The overall smoke detector market is expected to reach from USD 1.31 billion in 2017 to USD 2.52 billion by 2022, at a CAGR of 9.2% during the forecast period. The base year considered for the study is 2015, and the market size forecast is given for the period from 2016 to 2022. With the increasing government funding, the market for smoke detector would have a positive outlook until the end of 2020, especially in the residential sector. The governments of most developed economies provide monetary support for the installation and maintenance of smoke detectors in homes and buildings. For instance, the U.S. federal government provided a grant of USD 110,000 to the Berrien Springs – Oronoko Township Fire Department to raise awareness about smoke detectors. Various enterprises across the globe have increased their expenditure on fire protection for safeguarding infrastructure and reducing human losses. Enterprises rely on equipment such as smoke detectors or smoke alarms, fire sprinklers, fire extinguishers, and other devices for fire protection within their premises. This increase in fire-related spending by a number of enterprises and SMEs across the globe is driving the demand for smoke detectors. The spending for smoke detectors is high in the North American region, followed by Europe and APAC. To define, describe, and forecast the global smoke detector market, segmented on the basis of power source, product, end-user industry, and services. The research methodology used to estimate and forecast the smoke detector market begins with capturing data on key vendor revenues through secondary research such as Hoovers, Bloomberg Business, Factiva, OneSource, Computing Technology Industry Association, Telecommunication Industry Association, Internet Engineering Task Force, Semiconductor Industry Association (SIA), and Fiber Channel Industry Association. The vendor offerings have also been taken into consideration to determine the market segmentation. The bottom-up procedure has been employed to arrive at the overall size of the global smoke detector market from the revenues of the key market players. After arriving at the overall market size, the total market has been split into several segments and subsegments, which have then been verified through primary research by conducting extensive interviews with key people such as CEOs, VPs, directors, and executives. The data triangulation and market breakdown procedures have been employed to complete the overall market engineering process and arrive at the exact statistics for all segments and subsegments. The breakdown of profiles of primary respondents has been depicted in the figure below. United Technology Corporation (U.S.), Tyco (Ireland), Honeywell International (U.S.), Johnson Controls (U.S.), and Siemens AG (Germany). Other major players operating in the market include Hochiki Corp. (Tokyo, Japan), Robert Bosch GMBH (Stuttgart, Germany), BRK electronics (U.S.), Nest (U.S.), and Schneider Electric (France) are profiled in the report. Where is the overall development of the smoke detector market taking place? Which are the new application areas that the vendors are exploring? Which are the emerging companies in the smoke detector market? 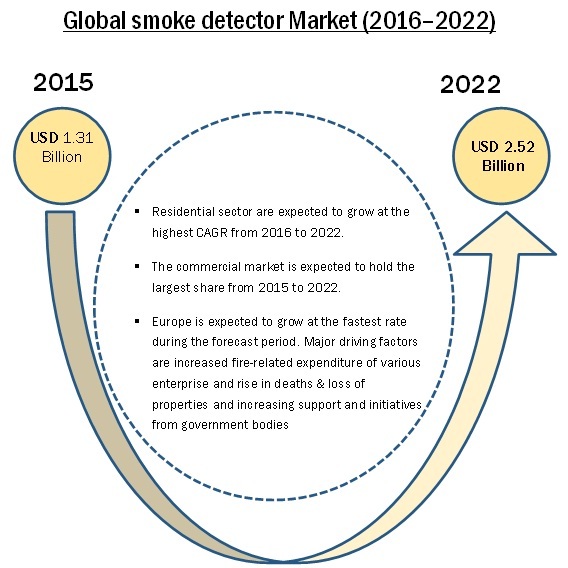 According to the new market research report on the smoke detector market, the market is expected to reach from USD 1.31 billion in 2015 to USD 2.52 billion by 2023, at a CAGR of 9.2% from 2018 to 2023. The growth of the market is propelled by increasing policies, regulations & government mandates along with enhancing technological innovations in equipment and networking. The high cost associated with the replacement of traditional smoke detector with smart detector is restraining the growth of smoke detector market globally. This report segments the smoke detector market by power source, product, end-user industry, services and geography. Based on power source, the market has been further divided into battery powered, hardwired with battery backup, hardwired without battery backup. The market for battery-powered smoke detector accounted for the largest size in this market. The battery powered smoke detector needs to be replaced frequently because of exhausted battery or disposition of battery chemicals in the enclosure of the smoke detector which needs to be cleaned timely. Therefore, the demand for hardwired with battery backup smoke detector is gaining popularity among the customers. The smoke detector market, by product, has been segmented into photoelectric smoke detector, ionization smoke detector, dual sensor smoke detector, and others. The market for photoelectric smoke detector accounted for the largest size in 2015. The cause of fire deaths is mostly from smoldering fires, which can only be detected by these photoelectric or the dual sensors and so the market of both smoke detectors is booming. The market for ionization smoke detectors has a low growth rate because of their rate of false alarms, which have led consumers to disable their smoke alarms. Also the disposal of ionization smoke detectors causes an additional problem because they contain radioactive materials. The smoke detector market, by service, has been segmented into engineering services installation & design services, maintenance services, managed services. The market for maintenance services accounted for the largest size in 2015. The smoke detector requires servicing and maintenance after a particular time interval to function reliably at the time of emergency; therefore, they are demanded frequently. The commercial buildings of retail centers; banking, finance, and insurance buildings; oil, gas, & mining business; manufacturing; energy & power; transportation; and other buildings demand routine servicing and maintenance of smoke detector; therefore, as a result of this, the market has developed at a fast pace. 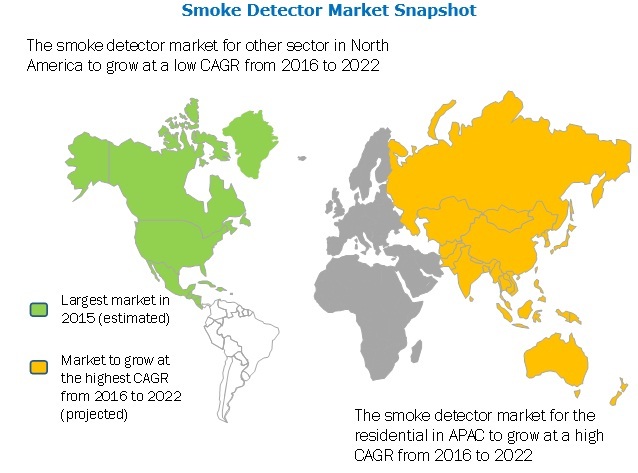 The smoke detector market, by end-user industry, has been segmented into residential, commercial, oil, gas & mining, transportation & logistics, telecommunications, manufacturing and other sectors. The market for commercial sector accounted for the largest size in 2015. Due to increase in the number of government mandate policies in developed economies to install smoke detectors at homes and rapid development in the residential construction across the world is attributing to the high growth of smoke detector market in the residential sector. In 2015, the North America region accounted for the largest share of the overall smoke detector market. The high demand for smoke detectors in mainly attributed to the rising number of fire deaths, especially in residential sector, along with the rise in residential construction in key states such as Texas, Florida, and California. The increasing government regulations to safeguard building occupants from fire accidents by installing smoke detectors is driving the market in this region. The high cost associated with the replacement of existing traditional smoke detectors with smart detectors is one of the major constraints for consumers. The cost to install a smoke detector varies according to the type and brand of smoke detector being used. But on an average to install two smoke detectors in a home would cost around USD 110 and it may also cost higher. This restricts the customers to install or replace traditional smoke detector with the new smart smoke detectors. Smoke detectors or alarms are highly effective and reliable elements of the total system designs for fire protection in buildings. Their installation in residential buildings has become common as these systems are effective in detecting, containing, and extinguishing a fire in the early stages. Hence, the demand for smoke detector is continuously increasing in residential applications. Moreover, authorities in the majority of developed countries, such as the U.S., Canada, and Japan, have amended their standard building codes and norms to install residential protection systems, thereby contributing to the growth of the market for smoke detector. Similarly, in European countries such as Austria, France, and Germany, the installation of smoke detector in homes has been mandated by the government. The key players in this vertical include Tyco (Ireland), Honeywell International Inc. (U.S.), and UTC (U.S.) among others. The commercial application of fire protection systems has been further segmented into academia & institutional; retail; healthcare; hospitality; and banking, financial services, & insurance (BFSI). Among these verticals, the retail vertical is expected to grow exponentially between 2016 and 2022, with increasing awareness and usage of smoke detectors in these buildings. The oil, gas, and mining (OGM) sector is prone to fire accidents due to the involvement of highly flammable materials such as oil, gasoline, and other combustible substances. Suitable fire detection and prevention systems are required in this sector to avoid accidents. The global solution providers for this segment include Honeywell International Inc. (U.S.), Tyco (Switzerland), Siemens AG (Germany), Appollo owned by Halma Plc (U.K.), Secom Plc (U.K.), Unisafe Fire Protection LLC (UAE), 3M (U.S.), Nowatec AS (Norway), and other companies. The state-of-the-art smoke detector system is an essential component for an effective business, allowing operations to quickly recover from a fire incident. A high level of fire protection is an integral part of responsible risk management strategies; oil and gas facilities require the best protection available. What could be the potential applications of smoke detector? Which power sources are largely used for smoke detectors? What is driving the growth of smoke detector market?